“Peace Date” was inspired by an experience I had walking down the street in Cape Town, South Africa this past January. I saw a street vendor singing and smiling, obviously so happy that I had to engage him. I asked what he was singing about and he pointed to the sky saying, “We are light in the darkness.” Nur and I took it from there. Nur Felix is an incredible songwriter/artist from Cape Town and I was honoured to co-write this song with him. Help us spread the message around the world. Well, where do I begin? A friend and I were the winners of 2 tickets to go spend a wonderful evening, starting with original songs by Nancy Beaudette, whose lyrics and guitar playing always move me. She sets the tone, with her friendly, smiling, welcoming stage presence, making the audience feel comfortable, relaxed, at home. Then enter the rest of the Entourage, equally at ease, friendly and fun. These gals can play, with tremendous virtuosity, humor, and skill. 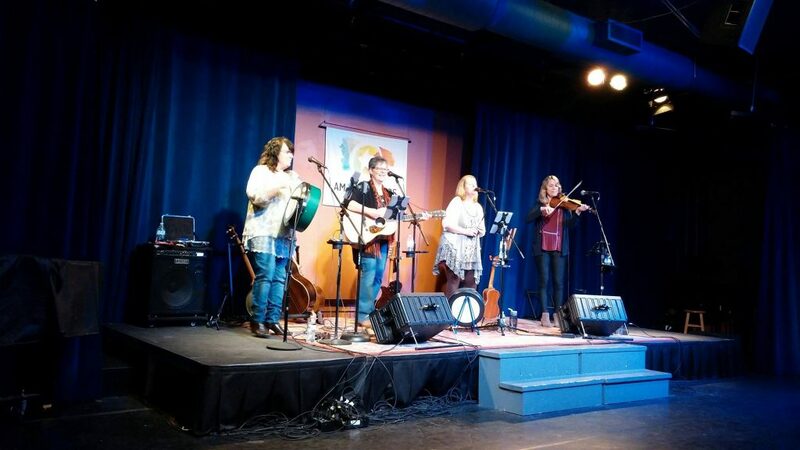 They manage to breeze thru tongue twisting sea shanties, ballads, and rousing drinking songs with ease, and never fail to lift your spirits, with brilliant harmonies. Chris Hatch especially showed her skills; it seemed she picked up a different instrument for each song, be it banjo, bodhran, guitar, harmonica, you name it, she can play it! These women are quite genuine with their Celtic/Irish/Scottish ditties, and equally adept at every other genre they take up. I was especially moved by the song, “Will You Go, Lassie, Go?”. Reminiscent of expert groups of the ’70’s, like The Shaw Brothers, Clancy Brothers, and what fun that this is an all-gal group. I look forward to their upcoming CD and hope there will be an opportunity for advanced sales. Thanks so much, Darlin’s, for a delightfully enjoyable evening! MORE MORE! Encore! Moonlit Pond Records is pleased to announce that another one of Nancy Beaudette’s songs from “Fa La La” has received recognition! “Gold and Myrrh” is a FINALIST in the 2016 Great American Song Contest. Over 1800 songwriters from 44 countries entered their work, yet this song stood out to the judges. This is the second song on ‘Fa La La’ to be honored. “Silence Tonight” has received numerous accolades since it’s release. Listen to the song and/or buy the CD here.